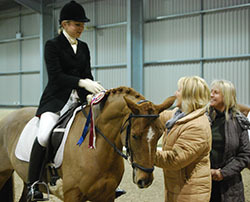 There are sections for 4, 5 and 6 year old ponies and there are no qualifiers, so entry is direct to the Championships and is open to BD registered and un-registered ponies up to and including 148cms (149 cms with shoes) in height and riders/owners need not be BD members and may be any age. Although late entries will be accepted if there is still space in the class, early entry is advised. 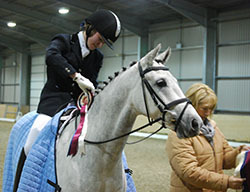 2010 Champion - Rufus (Renoir x Nerz) receives his rosette and sash while wearing his prize rug. Rider Francesca Walker. Spectators are welcome at this event and a running order will be available including information about the breeding of each pony. The Vale View Restaurant will be open serving hot and cold food and drinks and there will be other information about the SPSS and our graded stallions, mares and youngstock. Stabling: Stabling is available, please contact Vale View Equestrian Office on 01664 823739 to book. Judges: Jenny Ward and Sarah Pidgley, who as well as being British Dressage List One Judges, are also the British Dressage Pony Team Selectors. Click here to download a Schedule with Rules and list of Prizes. The schedule is in Adobe PDF format - click here to download the Adobe PDF reader if you don't have it already. To be judged as per BD Young Horse classes. Entries to be accompanied by a copy of the ponies pedigree (so that breeding information can be published). Prize Money of £75 to highest scoring pony across all sections; £50 to next highest scoring pony overall; £25 to third highest scoring pony overall. 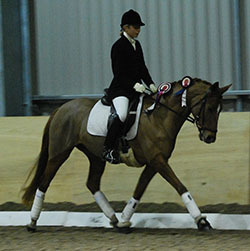 SPSS Thermatex Rug to Highest Scoring Pony (over all sections). 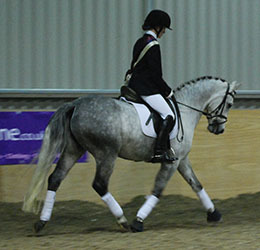 Voucher for British Dressage Horse Registration to highest scoring pony; voucher for 50% off Horse Registration to other two section winners. Click here to download a Schedule with Rules and list of Prizes.